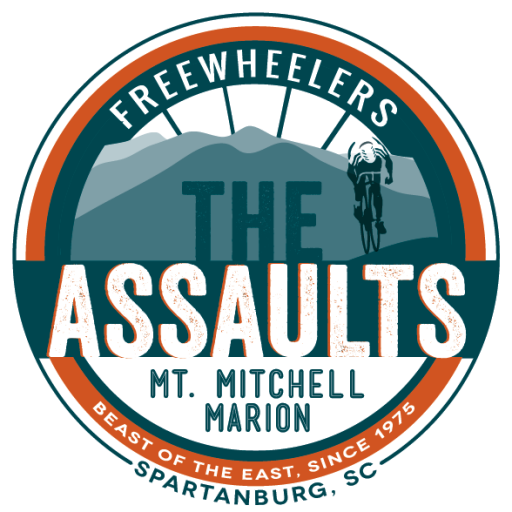 The 44th Annual Assaults presented by Prisma Health welcomes friends and family to cheer on their riders along the course! In order to make your experience more enjoyable, please note the following information. For a downloadable version, please click AOMM Spectator Guide 2019. Per state and local laws, you will not be able to directly follow your rider. In order to maintain the safety of all riders, we suggest you follow this “spectators course” in order to cheer on riders. At the campground, you can get on the spectator bus and go all the way to the top to meet your athlete. Due to safety concerns, family/friends/personal SAGS cannot drive to Mt. Mitchell. This is a policy set forth by the Blue Ridge Parkway and Mt. Mitchell State Park that we must adhere to. If you would like to see your rider finish at the top of Mt. Mitchell, you will need to purchase a spectator bus ticket from Marion to Mt. Mitchell for $15 here. The first bus leaves at 10 a.m. and the last bus leaves at 2 p.m. from Tom Johnson Campground. The bus ride is approximately 1 hour and 40 minutes. You will be allowed to return to Marion on the same bus as your rider. You can enjoy lunch at Tom Johnson Campground with your rider by purchasing a meal ticket here. Tickets will also be sold at the Rider Registration & Expo sponsored by Suntrust Bank (cash or credit) and at Marion on Monday (cash only). Spectators are welcome to purchase event t-shirts and other merchandise through the online store. If you want to support your rider please do so in areas designated in the AOMM Spectator Guide 2018. If you are parked on the route you will be moved by authorities including police, ride staff and parkway staff patrolling the route. If you are assisting a rider along the route, the rider will be immediately disqualified and removed from the final listing. Thank you in advance for helping us keep our riders safe. If riders need support there are marshals, SAG and Tech support fully staffed throughout the ride route and officially marked.